The Rajasthani ballad, the Hamir Hath or 'Pride of Hamir'. composed by the bard Sarangdhar, relates the story of Raja Hamir, the Chauhan ruler of Ranthambore, who battled with Ala-ud-din, the Sultan of Delhi. A series of paintings illustrating the story are known to have been presented in 1810 by the artist Sajnu to his patron Raja lshwari Sen of Mandi. The aritst presented these to the Mandi ruler after having left Kangra and his former patron Sansar Chand. The current work although illustrating the same story belongs to a later series produced at the court of Mandi. A composition that appears to be from the same series as the current example is now in the Reitberg Museum collection, and has been dated to the mid 19thcentury. The painting is inscribed on the reverse with verses 118-134 from the text of the Hamir-Rasa. According to the story, Raja Hamir was enjoying a dance performance in his court. On seeing the festivities from his camp Ala-ud-din Khilji, became angry and asked his archer Mir Gabru to murder the dancer. The archer instead of killing the dancer aims at her foot, wounding her, and disrupting the dance performance. 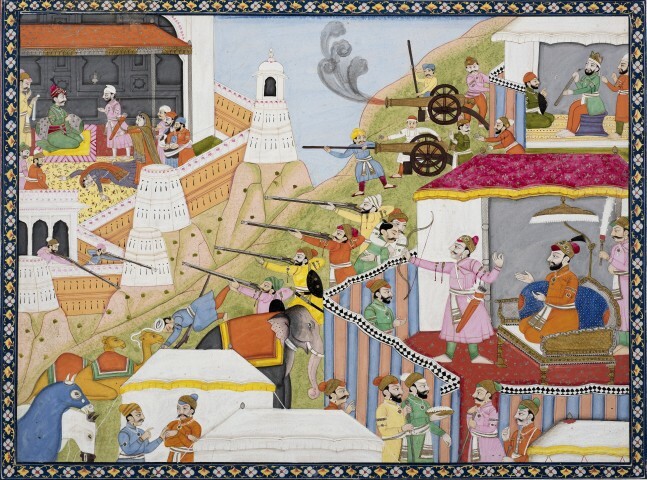 In response, Mahima Mir, who is present at the court of Hamir, shoots an arrow hitting Khilji's crown. In the current painting, Mir Gabru can be seen with bow raised, having just shot his first arrow from Khilji's tent. In the upper-left corner of the painting the dancer is seen lying on the ground wounded surrounded by an astounded group of musicians. Mahima Mir can be seen asking the King if he could shoot an arrow in return.